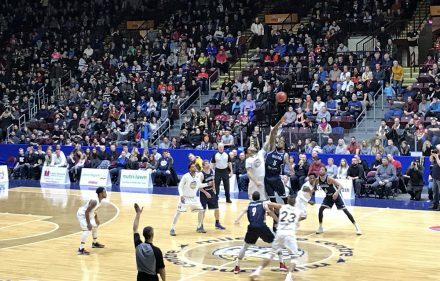 The NBL season has tipped in Canada and one of the early title contenders heading into the season are the Saint John Mill Rats, already out to a 2-0 record heading into Wednesday’s match up with the Moncton Miracles, who have had a rough start to the season, winless heading into this game 0-3. Both teams hail from New Brunswick, which borders Maine, and while this was a road game for Moncton, the two cities are only about 90 minutes apart. Saint John has added some new weapons heading into the season to complement 2014-15 league MVP Anthony Anderson, most notably Gabe Freeman, a 6’6″ power forward who also was a former league MVP. 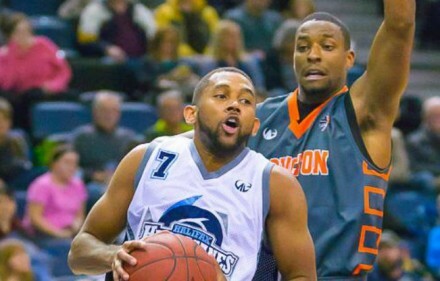 Other notable players include Moncton’s Dexter Strickland, who played his collegiate ball at North Carolina, as well as Saint John guard Doug Herring, Jr., who teams up with Anderson to make an All-Star combo. While Saint John relies heavily on small lineups and transition offense from a high-octane backcourt, Moncton’s primary scorer is their big man Shane Burrell, a 6’8″ forward/center who is a banger in the paint. Early on, Moncton didn’t play like the underdog, exchanging leads with the Mill Rats, but guard Corey Allmond poured in 23 first quarter points to give Saint John a 39-35 edge at the end of the first, including a buzzer-beating deep three ball. However, in the second, Allmond wasn’t able to find that shooting stroke as easily and the back and forth play became a match of specific strengths- Moncton attempting to work the ball inside to Burrell while Saint John looking to run at every chance. The inside game wasn’t consistent in the second quarter, but Moncton’s Anthony Gurley hit two big 3 pointers to keep Moncton close just when Saint John looked to break the game open. None of the speedy guards in the game – Anderson and Herring, Jr. for Saint John and Strickland for Moncton – could get open looks at the basket or effectively slash and score. 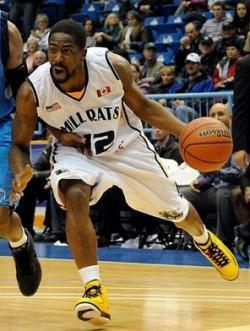 The Mill Rats like to employ a three guard lineup on the floor quite a bit, but were still able to rebound defensively and looked to start the break. Herring finished the half with a deep three, and coming out of a late time out, Saint John went on a 9-0 run, finishing the first half up 64-54. The story of the third quarter was the sudden ignition of the Saint John backcourt, with Herring and Anderson suddenly unleashing a torrent of scoring which Moncton could not contend with. The Miracles only consistent offense came from post player Burrell, who did have some success scoring inside and getting himself to the line, even cutting the lead back to 4 points, but the high speed attack of Saint John just quickly became too much for Moncton to handle, quickly running the margin back out to 13 points and never looking back, finishing the 3rd up 91-79, and eventually just maintaining the lead throughout the remainder of the game. The Miracles were able to cut the lead to just 6 before falling, 121-112. Anthony Anderson (G, 5’11”, Saint John) – Was quiet in the first half, unstoppable in the second. Quick, sure handed dribbler who can slash and score extremely effectively. Doug Herring, Jr. (G, 6’3″, Saint John) – Like Anderson, heated up in the second half and was pouring in points that Moncton couldn’t adjust to. very good slasher and can pass out of the drive very well; draws the defense to him on slashing plays because of his ability to score. Anthony Stover (PF/C, 6’11”, Saint John) – A recent addition to the roster, came off of the bench and made an impact in multiple ways; has good length and can score, but really understands how to play within the team concept from the post. Shane Burrell (PF/C, 6’8″, Moncton) – A power post player who is undersized in some respects, as a below the rim post player, but is a banger and was effective in scoring to keep Moncton in it. Sat for much of the third quarter and conditioning could be an issue. Dexter Strickland (G, 6’3″, Moncton) – I was interested to see what Strickland would bring to the table in this game, as he played in the ACC, and he did add some scoring from the perimeter; however I still see issues with him at the PG spot – he is much more effective from the SG position and can be turnover prone when playing the 1.